was greater than for temperate species. but imports of most other species increased in April. shipments (1,454 cu.m.) to the US in April. 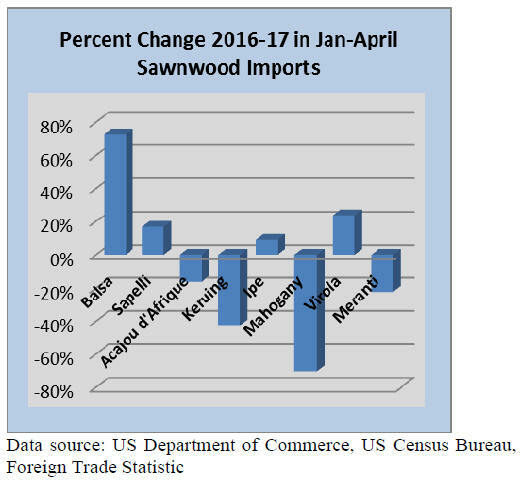 imports was up 4% from April 2016.
balsa from the US in April. flooring sales in 2016, and 56% of total square foot sales. solid and engineered wood flooring. manufacturers invest in new production capacity. distributors and retailers turn to domestic sources. suppliers were able to provide more species and colours. 13%. US-made flooring prices declined 8.2% in 2016.
growth in Chinese-made flooring prices. the-art wood flooring production capacities. importer to comply with the Lacey Act. universities for seismic, fire and acoustic performance. simplify the design and permitting process. Tall Buildings and Urban Habitat. tower also in timber and steel in Paris, France.